Lunar or planetary exploration rovers are expected to have the ability to move across an area as wide as possible in an unknown environment during a limited mission period. Hence, they need an efficient navigation method. Most of the surface of the moon or planets consists of flat ground, sand, and scattered rocks. In a simple flat sandy terrain with some rocks, rough route planning is sufficient for a lunar or planetary rover to avoid obstacles and reach an assigned point. This paper proposes an efficient vision-based planning scheme for exploration rovers on a flat surface with scattered obstacles. In the proposed scheme, dangerous areas are robustly extracted by processing image data, and the degree of danger is defined. A rough routing plan and sensing plan are simultaneously constructed based on the dangerous-area extraction results. The effectiveness of the proposed scheme is discussed based on the results of some simulations and simple experiments. R. Ejiri, T. Kubota, and I. Nakatani, “Vision-Based Behavior Planning for Lunar or Planetary Exploration Rover on Flat Surface,” J. Robot. Mechatron., Vol.29, No.5, pp. 847-855, 2017. R. Volpe and S. Peters, “Rover Technology Development and Infusion for the 2009 Mars Science Laboratory Mission,” Proc. of the 7th Int. Symposium on Artificial Intelligence and Robotics and Automation in Space, 2003. M. V. Winnendael, P. Baglioni, and J. Vago, “Development of The ESA Exomars Rover,” Proc. of the 8th Int. Symposium on Artificial Intelligence, Robotics and Automation in Space, 2005. C. R. Weisbin, D. Lavery, and G. Rodriguez, “Robotics Technology for Planetary Missions Into the 21st Century,” Proc. of Int. Symposium on Artificial Intelligence, Robotics, and Automation for Space, pp. 5-10, 1997. T. Kubota, Y. Kuroda, Y. Kunii, and I. Nakatani, “Micro Planetary Rover “Micro5”,” Proc. of 5th Int. Symposium on Artificial Intelligence, Robotics and Automation in Space, pp. 373-378, 1999. C. Covault, “Curiosity’s mission to Mars,” Aerospace America, AIAA, pp. 28-35, 2011. T. Yoshimitsu, M. Ootsuka, T. Kubota, and I. Nakatani, “Semi Autonomous Telescience System for Planetary Exploration Rover,” J. of Robotics and Mechatoronics, Vol.12, No.4, pp. 432-437, 2000. K. Iizuka, T. Sasaki, H. Hama, A. Nishitani, T. Kubota, and I. Nakatani, “Development of a Small, Lightweight Rover with Elastic Wheels for Lunar Exploration,” J. of Robotics and Mechatoronics, Vol.24, No.6, pp. 1031-1039, 2012. H. W. Stone, “Mars Pathfinder Microrover A Small, Low-Cost, Low-Power Spacecraft,” Proc. of the 1996 AIAA Forum on Advanced Developments in Space Robotics, 1996. R. Li, S. W. Squyres, R. E. Arvison, B. A. Archinal, J. Bell et al., “Initial Results of Rover Localization and Topographic Mapping for the 2003 Mars Exploration Rover Mission,” Photogrammetric Engineering and Remote Sensing, Vol.71, No.10, pp. 1129-1142, 2005. R. Arvidson, K. Iagnemma, M. Maimone, A. Fraeman, F. Zhou, M. Heverly, P. Bellutta, D. Rubin, N. Stein, J. Grotzinger, and A. Vasavada, “Mars Science Laboratory Curiosity Rover Megaripple Crossings up to Sol 710 in Gale Crater,” J. of Field Robotics, rob.21647, 2016. P. Tompkins, A. Stentz, and D. Wettergreen, “Global Path Planning for Mars Rover Exploration,” Proc. of the 2004 IEEE Aerospace Conf., 2004. R. Simmons, E. Krotkov, L. Chrisman, F. Cozman, R. Goodwin, M. Hebert, L. Katragadda, S. Koenig, G. Krishnaswamy, Y. Shinoda, and W. Whittaker, “Experience with Rover Navigation for Lunar-Like Terrains,” Proc. of the 1995 IEEE/RSJ Int. Conf. on Intelligent Robots and Systems, pp. 441-446, 1995. C. Urmson, M. B. Dias, and R. Simmons, “Stereo Vision Based Navigation for Sun-Synchronous Exploration,” Proc. of the 2002 IEEE/RSJ Int. Conf. on Intelligent Robots and Systems, pp. 805-810, 2002. L. Matthies, M. Maimore, A. Johnson, Y. Cheng, R. Willson, C. Villapando, S. Goldberg, and A. Hueertas, “Computer Vision on Mars,” Int. J. of Computer Vision, 2007. P. Muñoz, M. D. R-Moreno, A. Martínez, and B. Castaño, “FAST Path-Planning Algorithms for Future Mars Exploration,” i-SAIRAS2012, 10A, 2012. S. Singh, R. Simmons, T. Smith, A. Stentz, V. Verma, A. Yahja, and K. Schwehr, “Recent Progress in Local and Global Traversability for Planetary Rovers,” Proc. of the IEEE Int. Conf. on Robotics and Automation, 2000. R. Volpe, T. Estlin, S. Laubach, C. Olson, and J. (Bob) Balaram, “Enhanced Mars Rover Navigation Techniques,” Proc. of the IEEE Int. Conf. on Robotics and Automation, pp. 926-931, 2000. D. Pai and L. Reissell, “Multi-resolution Rough Terrain Motion Planning,” IEEE Trans. on Robotics and Automation, Vol.14, No.1, 1998. T. Kubota, I. Nakatani, M. Itoh, T. Iijima, and T. Adachi, “Fuzzy Based Navigation for Planetary Rover by using Range Image,” Proc. of the 14th Annual Conf. of Robotics Society Japan, pp. 261-262, 1996. A. Howard, B. Werger, and H. Seraji, “Integrating Terrain Maps into a Reactive Navigation Strategy,” Proc. of the IEEE Int. Conf. on Robotics and Automation, 2003. M. Massari, G. Giardini, and F. Bernelli-Zazzera, “Autonomous Navigation System for Planetary Exploration Rover based on Artificial Potential Fields,” Proc. of the 6th Cranfield Conf. on Dynamics and Control of Systems and Structures in Space, pp. 153-162, 2004. T. Kubota, I. Nakatani, and T. Yoshimitsu, “Path Planning for Planetary Mobile Robot,” Proc. of JSME Annual Conf. on Robotics and Mechatronics, No.A323, pp. 129-134, 1994. S. B. Goldberg, M. W. Maimone, and L. Matthies, “Stereo Vision and Rover Navigation Software for Planetary Exploration,” IEEE Aerospace Conf. Proc., Vol.5, pp. 2025-2036, 2002. L. M. Lorigo, R. A. Brooks, and W. E. L. Grimson, “Visually-Guided Obstacle Avoidance in Unstructured Environments,” Proc. of IEEE Int. Conf. on Intelligent Robots and Systems, pp. 373-379, 1997. R. Ejiri, T. Kubota, and I. Nakatani, “Vision based behavior planning for planetary exploration rover,” Proc. of 10th Int. Conf. on Advanced Robotics, pp. 535-540, 2001. 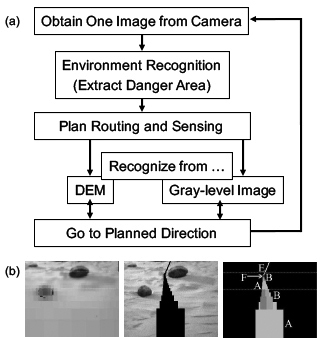 T. Kubota, R. Ejiri, Y. Kunii, and I. Nakatani, “Autonomous Behavior Planning Scheme for Exploration Rover,” 2nd Int. Conf. on Space Mission Challenges for Information Technology (SMC-IT), 2006. A. P. Pentland, “Linear Shape from Shading,” Int. J. of Computer Vision, Vol.4, No.2, pp. 153-162, 1990. T. Kubota, R. Ejiri, and I. Nakatani, “Autonomous Exploration Behavior Planning for Planetary Rover,” 6th IFAC Symposium on Intelligent Autonomous Vehicles (IAV), 2007.